Update (07/28/11 @ 12:40 EST): Various sources are theorizing the arrested suspect may not actually be "Topiary". Despite this, no official statement has been given at this time. Evidence supporting the theory appears to be very conjectural, however, this would not be the first time such a mistake has occured during hacker arrests. On Wednesday, yet another suspected member of Lulz Security was arrested in Britain. The 19-year old suspect is thought to be "Topiary", one of the founders of Lulz Security and certainly one of the more public figures within the group. The young man has given a few press interviews, has been managing the group's Twitter feed and has publicly taken responsibility for a number of high-profile hacks. His arrest is the result of an ongoing investigation into Distributed Denial of Service (DDoS) attacks which targeted a variety of websites earlier this year. 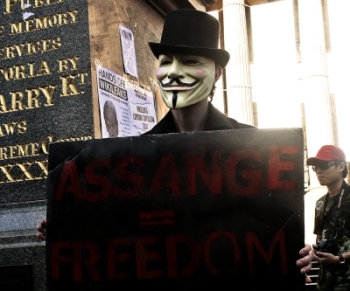 In response to recent hacktivist arrests and continued outrage at PayPal's decision to freeze Wikileaks' account, Anonymous has issued another statement with their typical flair for the dramatic. Although with seemingly little relevance, Anonymous has made an oddly specific appeal on their blog requesting a public boycott of PayPal. While this appears to be without any immediate provocation, PayPal was targeted by the DDoS attacks which triggered the investigation leading to Topiary's arrest. In the "official communique", Anonymous criticizes the FBI's operations to bust hacktivists who are "involved in ethical, modern cyber operations". They go on to chastise regulators for the stiff legal reprocussions of committing cyber crime, citing $500,000 USD fines and 15 years behind bars as an example. The blog post echos their signature anti-corporate and anti-government message, justifying the means by which they achieve their goals and labels Wikileaks, "a beacon of truth in these dark times". After the FBI arrested 17 members a few weeks ago, Lulz Security officially disbanded. However, many remaining members continue to be active under the "Anonymous" umbrella. With the recent arrest of two Lulz Security founders, "Tflow" and "Topiary", it is thought only 4 core members of Lulz Security remain.